Here is one I made a few years ago. 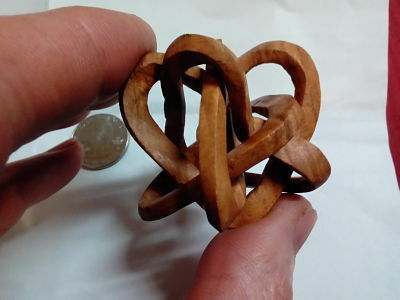 It is four interlinked mobius strip, heart shapes. 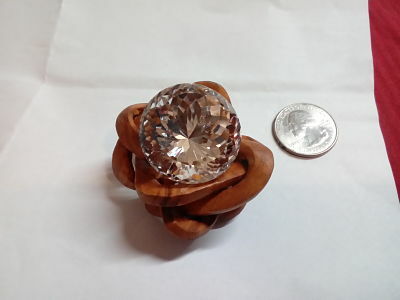 Carved from a single piece of curly maple. A mobius strip is a twisted strip with only one side. Here is another view that shows the heart shaped rings better. Its one of those things you don't hand to everyone for fear they might crush it. Lots of work, all hand chisels and files. Her is what it's useful for, a stand for a 32 carat quartz stone I faceted myself. Come on give us some feedback.. Sorry Jim, the forum has not been a lively place for some time. Was the curly maple more challenging to carve because of the irregular grain? I can barely wrap my head around figuring out a simple mobius, but I have done at least a couple of them. 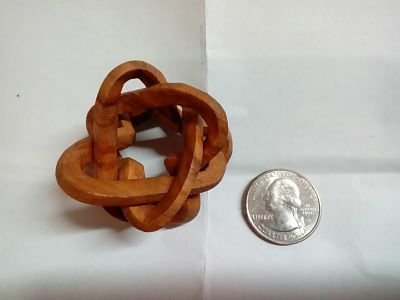 Trying to do a quad with heart shapes almost hurts my brain and eyes to begin to imagine cutting it from the wood and having it all meet up, with the twist in there somewhere. I have already forgotten your intro, are you a trained gem stone cutter? That gem above has quite a lot of facets. I'll bet that in bright, full spectrum light that it is quite a sparkler. It seems like forums do come and go, People post things for a while then wander off. No worries though, I am just trying to get some of the quiet ones to speak up. People looked at the post, just didn't say boo..
That's okay, I end up talking to myself a lot in real life too. I actually like the big leaf curly maple for carving. It cuts nice and the interlocked grain seems to help keep it from splitting pieces. The interlocking part was tricky, I made the first one from modeling clay and used it for figuring out the sequence. That stone is pretty bright in spite of it only being quartz, It turned out really nice. Don't think I could do it again. It help to be a little obsessive compulsive sometimes, especially when some one tell me I can't do something. Of course then, I HAVE to figure it out. And the more challenging and tougher the project, the harder my head gets. Sometimes its hard to know what to say, looks pretty cool though.